Russian journalist Oleg Kashin, injured in a brutal assault in November 2010, has published in an article on his blog the names of his alleged attackers, two of whom are awaiting trial. However, the identity of those who ordered the attack remains unknown, and Kashin says that any decision on finding them will be political. 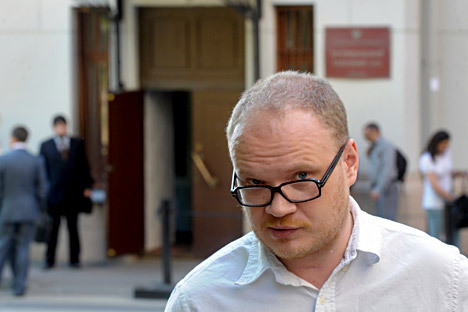 Four years after he was attacked and severely beaten outside his apartment in November 2010, prominent Russian journalist Oleg Kashin, best known for his reporting on protests against the destruction of the Khimki forest outside Moscow several years ago, has published an article in which he reveals the names of the men who allegedly carried out the assault, though the identity of those who ordered the attack remains unknown. According to Kashin, the two attackers were security guards Daniil Vesyolov and Vyacheslav Borisov, who work for the Mechanical Plant in St. Petersburg, while a third man who was waiting for them in a car was identified as their colleague Mikhail Kavtaskin. This information was confirmed by the Investigative Committee of Russia. Kashin wrote that Vesyolov and Kavtaskin were charged with the offense at the end of June 2015 and are in custody. Borisov, who was included on a federal wanted list, is on the run. Oleg Kashin is a well-known Russian political journalist who worked at various times for a range of publications, including the dailies Kommersant and Izvestiya, as well as the magazines Expert and Russkaya Zhizn. Kashin is perhaps best known for covering the protests against the construction of the Moscow-St. Petersburg highway through the Khimki Forest in 2010. In May 2013, Kashin moved to Geneva, Switzerland with his wife. However, he continues to write for Slon, Svobodnaya Pressa, Sputnik i Pogrom and other publications. In 2014, he launched his own website Kashin.guru, where he publishes work by several other authors in addition to himself. On the night of Nov. 6, 2010, Kashin was severely beaten by two unknown men outside his home in central Moscow. The journalist sustained multiple fractures of the limbs and jaws, a concussion and a torn-off finger. He was put into an artificial coma and had several complicated surgeries. Kashin was able to return to active work only a few months later. How was the investigation conducted? Prime Minister Dmitry Medvedev, who was president at the time, promised to take the investigation into the attack on Kashin under his personal control. However, in the past few years virtually no new information has appeared, and Kashin has filed a lawsuit with the European Court of Human Rights about the inaction of the FSB in his case. However, in his Sept. 7 article, Kashin thanked Medvedev and representatives of the Investigative Committee for the work they put into the case. The supposed masterminds of the crime, according to Kashin himself, could have included representatives of pro-government youth movements Nashi and Young Guard, which have close ties to the Kremlin (Kashin criticized their activities), people associated with the administration of the Moscow Region town of Khimki, and the governor of the Pskov Region, Andrei Turchak, whose family owns the Leninets holding company, of which the Mechanical Plant in St. Petersburg is part. Who is the organizer of the crime? This is not yet clear. Vesyolov and Kavtaskin testified that the organizer of the attempted murder of Kashin was the manager of the Leninets holding company, Alexander Gorbunov. Leninets paid the attackers 3.3 million rubles ($48,000 at the current exchange rate, or $107,000 at the exchange rate in 2010) for the crime. Gorbunov is also under arrest in St. Petersburg, but so far only for possession of weapons. The fact that the attackers worked at the plant, which is part of the holding company Leninets, owned by Turchak’s family, has led many experts and Kashin himself to speak in favor of the version that it was Turchak who ordered the attack on Kashin. However, Kashin himself has not so far said so directly, because Turchak’s name does not appear in the case. Turchak declined comment through his spokesman. What was the conflict between Kashin and Turchak? In August 2010, in one of the discussions on his personal blog, Kashin called Turchak by a pejorative, though not addressing him personally. Turchak responded to this comment by suggesting that Kashin apologize within 24 hours. Kashin’s question of whether it was a threat remained unanswered, while Turchak subsequently removed his original comment.